I am a bit late posting this, but Saturday 29th November was the Saab’s latest oil and filter change. The 5W40 Mobil 1 had been in since May, a whole 6 months, which included the Ring trip and Llandow trackday, but limited other driving. Went over to Steve’s who had kindly offered to help with this ‘easy’ job; he has the benefits of a spacious double garage and some home-built ramps which are easier than jacking and axle stands. The work was preceeded by a drive in both our cars, indluding a short burst of acceleration where it was interesting to compare the Saab with a single-turbo Supra. Steve is welcome to comment on this. Into the garage, onto the ramps, and off with the sump plug… Maybe not with a socket set then, but with a big spanner. Ok, a big spanner and a hammer. That gets the sump plug off and the oil drains. Very nice oil it is too, not showing many signs of age, as you would expect. Oil drained, time for the filter. This should be removable by hand… Some straining later, maybe not by hand then. Luckily Steve had a ratchet strap made of tough fabric which then was tightened by spanner. After applying maximal force the oil filter was nicely squashed, but no movement. Time for Plan C. Tough decisions have to be made, it’s out with a screwdriver and a big hammer. This is a good way to get hot oil to pour down your arm… Screwdriver inserted through the filter, and turn. Then try harder. Then get Steve to try. Then try again, turning as hard as I can… And it moves. 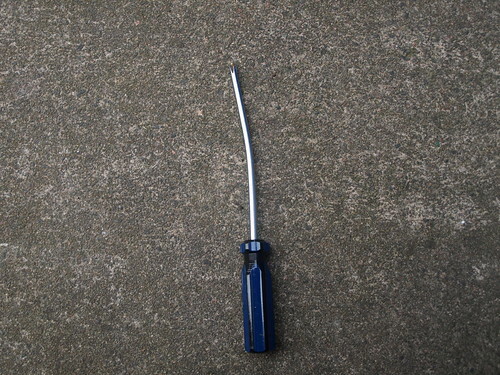 It also bends the fairly solid screwdriver. Give it a 1/4 turn, remove screwdriver, still not hand tight. 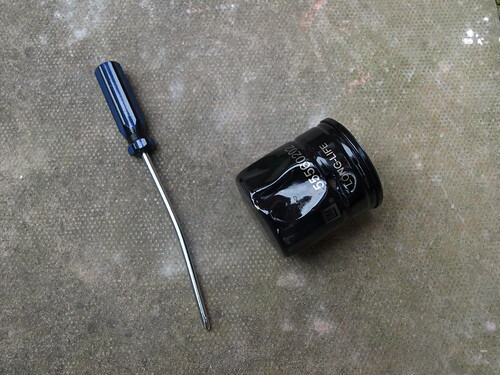 Have to hammer screwdriver through again, and another 1/4 turn. Takes yet another 1/4 turn to be able to remove it by hand. New filter and sump plug from Elkparts go on, oil filter pre-filled and only hand tight this time… Refill with new 5W40 fully synth (Shell Helix Ultra), and it is really hard to see the oil level since it is so clean. After a few drives it is a bit easier to tell it is near the max mark, but maybe I need coloured oil in future. We then drain the oil and remove the filter from Steve’s Supra, which has been having oil changes at what must be one of the most frequent intervals for any road car. No problems with his apart from the awkward filter position makes it easy to lose skin. We were going to do the plugs as well, but this filter change had taken so long that it was the end of the morning’s fun. Thanks to Steve for his assistance. In the pic below, it should be noted that the crushed bit of filter isn’t from the screwdriver, that’s from the filter removal strap.